Boy have things taken off. I have been working on many things, A few swaps, but a lot of cleaning and visiting. My boy friend is a big help in motivating me. He enjoys visiting and helping me CLEAN! I think he is a keeper. He doesn't make me feel guilty about anything. All he wants is for me to be happy. Isn't that cute? The 28th is our 1 year anniversary. He has it all planned. Dinner on a riverboat. Yes definitely a keeper. This is my latest Round Robin. I did the outer most row. I used all Batiks. It took a longer time that usual because I had to design each side separately, but worth it. Well off to bed and on to the next project. This sounds like a fun project. Lots of parts on that last row! Good job! Yes, good job. 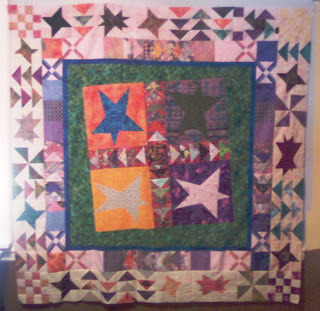 I had a hard time with it because my skills were not as good as the quilt and the time allowed. 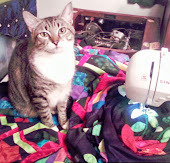 You are gifted at knowing what to do to pull quilts together.